WASHINGTON — You literally cannot make this up. Eliot Spitzer, the disgraced former New York governor, is making a run to be the state’s newest comptroller. One of his opponents? His alleged former madam, Kristin Davis. Reuters reports that Spitzer, who resigned as governor five years ago after a prostitution scandal, is trying to re-enter politics again. 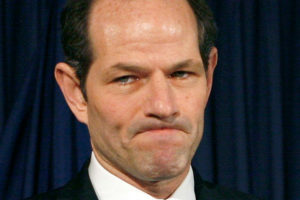 Davis, who is running as a Libertarian, used to run the prostitution ring when Spitzer was one of her alleged clients. Other candidates are Manhattan Borough President Scott Stringer, a Democrat, and Republican John Burnett, a Wall Street executive. Spitzer’s comptroller campaign announcement came as New York City’s mayoral campaign is underway and the frontrunner is Anthony Weiner. Weiner resigned from his congressional office two years ago after he publicly admitted to sending lewd pictures of himself to women, and he was newly married to a former Hillary Clinton staffer Huma Abedin.